Shubho Bijoya everyone. 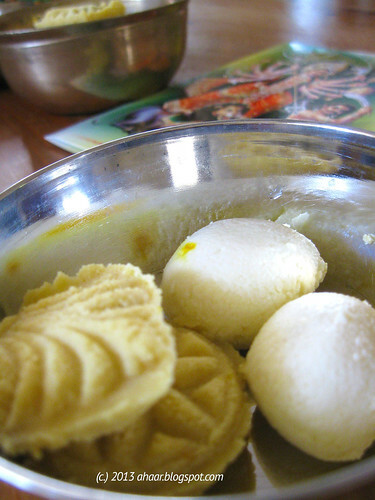 Here is some rosogolla and sandesh that I made during the Durga Puja for you all. How did you celebrate your festive season? Somehow, the last couple of months have been busy socially. We have had guests, and have hosted dinners and lunches with friends. Here are couple of pictures from the last dinner and lunch. 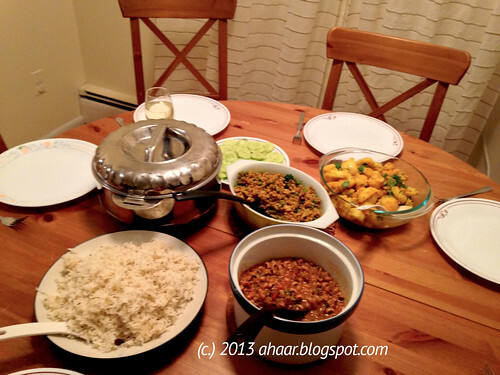 This was dinner with a friend visiting from India. The menu was keema matar, lobia, fresh cucumber salad, aloo ghobi (from another friend at the dinner), homemade chapatis and jeera rice. Dessert was turkish delight and mochi ice-cream. The last few days have been gorgeous around here. 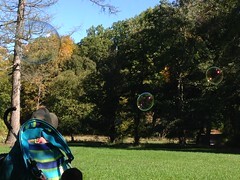 So yesterday we decided on am impromptu lunch picnic with friends and fun was had at the Nichols Arboretum. 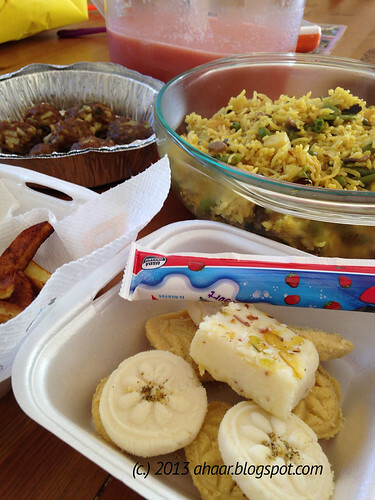 We took vegetable fried rice, chicken kebabs, alu bhaja (sauted potatoes), watermelon and banana smoothie and sandesh. Is there a recipe you have made multiple times and yet you tweak it every so often? It's the tomato chutney recipe for me. I've made it with raisins, dates and yet I am always looking for new combinations just to change it little bit. I've made it with apricots the last few times and want to share it with you. 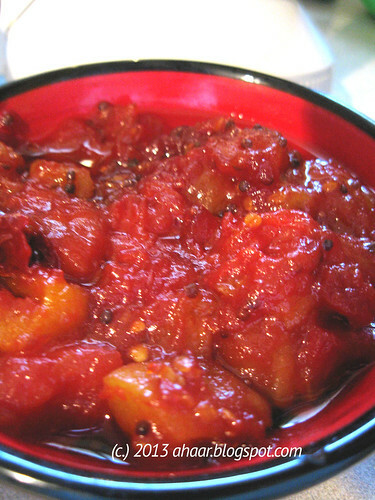 Nothing says the arrival of the Puja season like tomato chutney. Whether it is Durga Puja, Laxmi Puja, Kali Puja, or Saraswati Puja, or any other celebration, tomato chutney adds the sweetness to the khichudi. 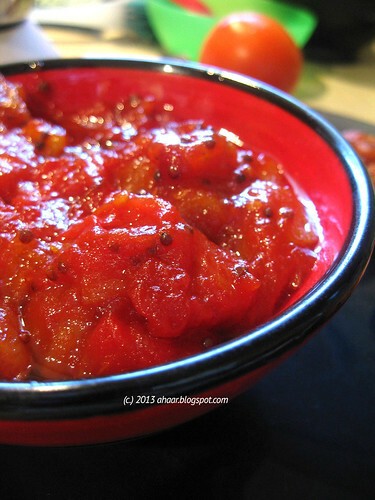 I have blogged about the tomato and date chutney before, and this is my new favorite. The apricots add the chewiness to the chutney and it tastes great with khichudi or even as a spread on sandwiches or a side with any other meal. Heat oil in a pan and temper it with mustard seeds, bay leaves and red chilli. Add the tomatoes and apricots cook it with closed lid on medium-low heat till the water from the tomatoes becomes less. Add suhar cook it for another 3-4 minutes. It becomes a thick mix and everything blends together. Now that Lil A goes to preschool and has a gang of friends, he comes home with new stories. Stories about his school day, what he did, but they don't come when I ask him. When I ask him about his day at school and what he did, he says "I don't know." Then the stories come out slowly at most unexpected times. Yesterday at dinner table he talked about how he "runned" and was the "bestest" superman. Later in the evening, when he was drinking milk he said his teacher said he was the "kindest leader" yesterday. My favorite moment was when he was in the bathroom and he told me "You are my 'bestest' friend." "You are too, my lil one, you are too." It reminded me of a time from my childhood, when I was very attached my thakuma (grandmother). My phisis would tease me saying, "dekh tor takumar gaal kheye niyechi." (see I ate your grandmother's cheeks). I would be greatly offended and smooth her cheeks with mine. Who do you consider your good friend? In other food news, we had a bumper herbs crop this year, so I have been using it lavishly. 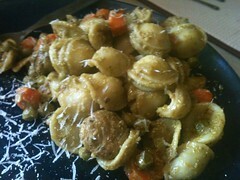 Here is a pasta I whipped up on a week night with a mix of parsely and mint pesto. I sauted some veggies, added the pesto and the pasta and mixed it all together and served with some fresh cheese. We also have been making veggie parathas regularly because Lil A loves it. 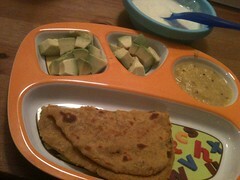 Here is a sample of his dinner plate - paratha, dal, avacado and some homemade dahi (yogurt). Lil A's love for ice-cream and popsicles continues. 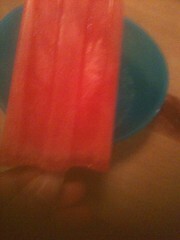 This is a quick watermelon popsicle that I made with watermelon, little sugar and lemon juice and pureed and froze it. What do your little ones like to eat? Coming back to this recipe, I have to say that this recipe has been sitting with me for a while. 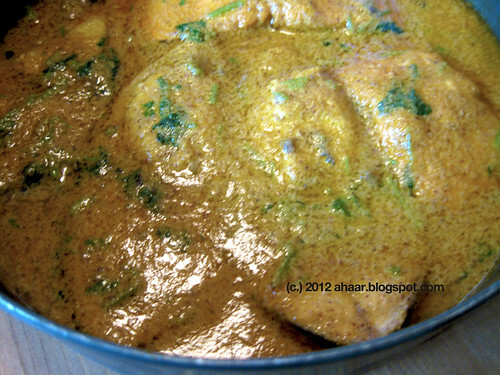 This is my dad's and my favorite way to eat ilish (shad). 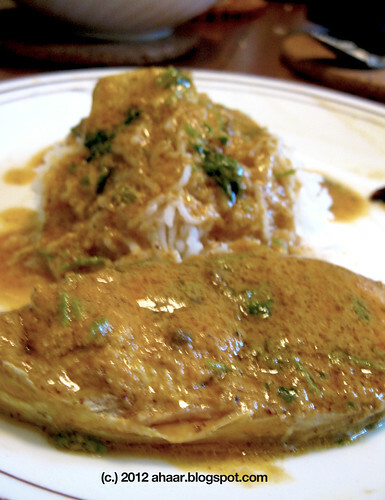 The other favorite is ilish with begun (eggplant). The fish is moist, soft and full of flavor. When my parents are visiting, I always make my trip to the bangladeshi store religiously to get pabda, tangra, rui and of course ilish. This year, the store owner told me all about the soaring prices of ilish back in Bangladesh and in the US. He double checked if I still wanted to buy ilish. I nodded and then he said "tomar jonne didi" (just for you sister) and took out an ilish with roe (not too big, not too small), and made steak pieces. Clean the fish and rub it with salt and turmeric powder. In a grinder, grind the green chilli with mustard seeds, turmeric powder and little water to make a smooth paste. 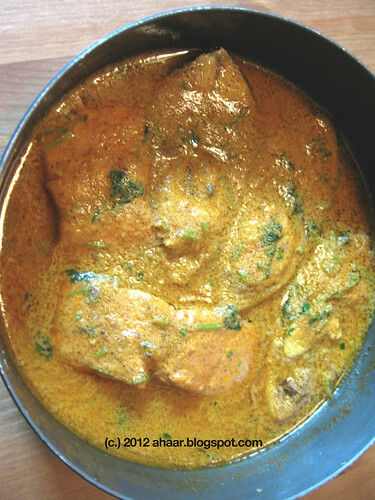 Take a vessel and put the paste, 1 1/2 cups water and make a smooth curry. Add the fish pieces in the paste. Add little salt to taste. Then add the mustard oil. Put the vessel in the pressure cooker and steam on low medium heat without the whistle for 12 minutes. Take out and garnish and serve with white rice.